I have been badly craving pizza. I wanted a crispy, thin crust pizza with some yummy cheese and a mountain of vegetables. But I don’t have a pizza stone, and all kitchen purchases are on hold until after we get married this summer … because, really, why buy something for yourself when someone else might buy it for you, amiright? However, thanks to my one true internet love, Serious Eats, I had another plan in mind – a pizza baked in a skillet. In particular, cast iron. I didn’t use any of the methods espoused on their site exactly, though I’m sure any of them would work fabulously. Sometimes, I just have an irrepressible urge not to follow directions. So, I started the dough in the cast iron to get it golden brown and slightly crispy on one side. Then, I added the toppings – tomato sauce and loads of veggies. I finished the whole thing off by popping it in the oven to cook the crust and veggies a bit, then added cheese for the last few minutes until it was all melt-y and golden brown and delicious. I was really impressed with the quality of pizza this method produced. The bottom crust was thin and crispy with a nice crunchy crust that had just enough give to make it toothsome. There was a nice char on the bottom of the pizza, too. It was incredibly easy, especially since I simply picked up some store bought dough from Corbo’s Bakery. As per usual with pizza, this is a highly customizable recipe. Add your desired sauce and vegetables before popping in the oven and then top with your favorite melt-able cheese. The real key is to make sure both your oven and your pan are hot hot hot when you get started, and to have all of your ingredients lined up and ready to go before you put the dough in the pan. I loved the balance of heat from the Hungarian hot peppers, sweet and slightly acidic, from the tomatoes and tomato sauce, salty from the black olive, and creamy from the mozzarella with a nice meatiness from the mushrooms, but consider this more of a “how to” than a true recipe. Preheat oven to 500º, or as hot as your oven will go. Remove pizza dough from the refrigerator and let rest at room temperature for an hour before cooking. Roll out dough on a lightly flour surface (or turn in hands until circular, which is the method I used because it’s easier to get a crust that way, in my humble, non-expert opinion) to a 10″ round. Heat the 10″ cast iron pan over medium-high heat for 5-6 minutes until very hot. Carefully place the dough in a 10″ cast iron skillet. Cook, shaking one or two times and turning the pan periodically to avoid hot spots, until the dough is easily removed from the pan, about 2-3 minutes. 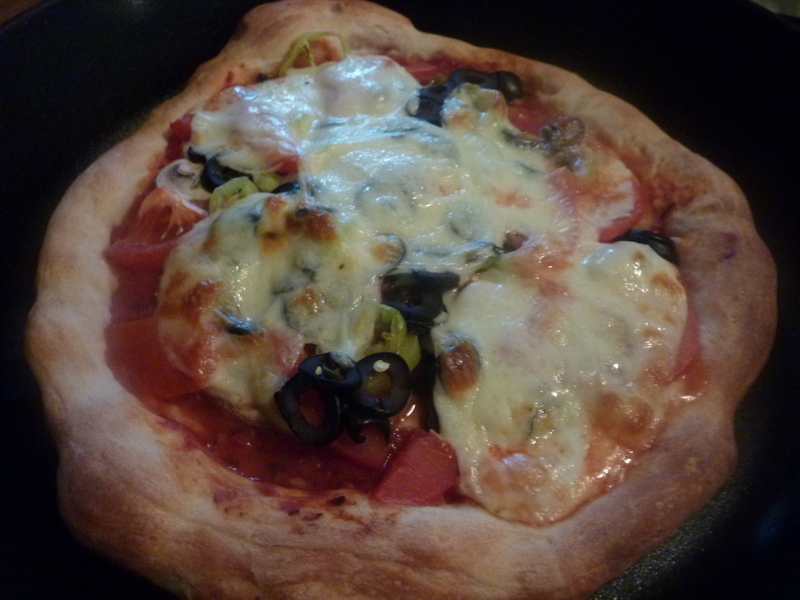 Carefully top with crushed tomatoes, leaving 1/2″ rim for crust, hot peppers, mushrooms, tomatoes, and black olives. At this point, the dough should have been in the pan for about 5-6 minutes total. Transfer to the preheated oven and cook about 8-10 minutes until dough is mostly cooked through. Add rounds of mozzarella and cook another 3-5 minutes until cheese is melted. I think Zak and I have started a summer tradition. Two weeks ago, we started the process of our first home brewed beer. That evening we grilled some pizzas. We cracked open a bottle of our first batch of home brew last night and, while it will certainly benefit from another week of carbonating and developing in the bottling process, it is absolutely delicious. So delicious that we decided to swing by Warehouse Beverage to grab another ingredient kit. We spent the afternoon getting everything ready to ferment and the evening grilling some delicious pizzas. I know, grilled pizza sounds weird at first. But it totally works and is totally delicious. And totally necessary if you’re craving a pizza when it’s 80-plus degrees out and you just can’t handle the thought of turning on your (newly fixed) oven. 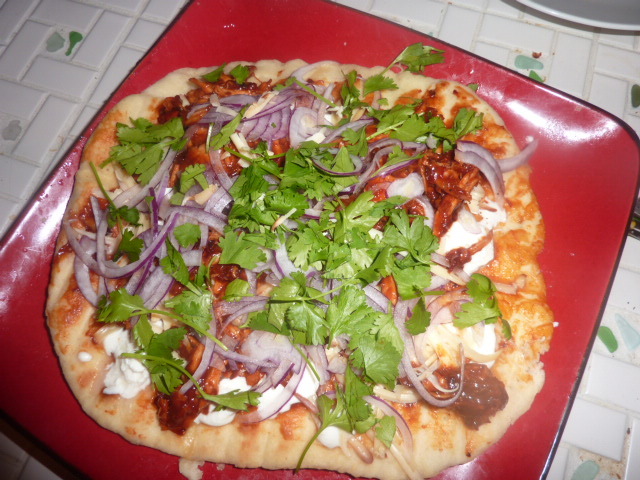 The first version, pictured above, is a chipotle barbecue chicken, inspired by California Pizza Kitchen‘s version. Zak isn’t crazy about barbecue chicken pizzas, so we collaborated by making a pizza with some thinly sliced turkey ham and beautiful runny eggs. Both versions were absolutely delicious. It’s very important that you have everything laid out and organized prior to putting the first round of dough on the grill because things move very quickly after that point. Combine all ingredients in bread machine on dough cycle. Let run one cycle. Once done kneading, turn off machine and remove dough from the machine. Divide into as many pizza crusts as you want (we did two). Knead each segment of dough roughly five minutes. Let rest under a damp towel for 30 minutes. Flatten each ball of dough between your hands. Shape, by turning dough as if you are turning a car wheel, into an oblong circle. In a medium saucepan, heat Brummel & Brown over medium heat until melted. Add onion and sauté until just beginning to turn yellow. Add remaining ingredients and simmer 15 minutes. Add chicken to simmering barbecue sauce (see above). Simmer 15 minutes to heat through and set aside. Brush one side of your dough rounds (see above) with plain olive oil. Flip dough, oiled side down, onto the middle of your grill rack. Brush the top side with plain olive oil. Cook, uncovered, until underside is golden brown, about 2-3 minutes on a gas grill or slightly longer on a charcoal grill. Flip crust over with tongs and spatula (or a pizza peel). Quickly brush 3-4 tbs. of chipotle barbecue sauce on the pizza. Top with cheese, chicken, and red onions. Season with kosher salt and freshly cracked black pepper. Close grill top and cook until underside is golden brown and cheese is beginning to melt, about 3 minutes on a gas grill or slightly longer on a charcoal grill. Remove from grill and let rest a few minutes. Top with cilantro and serve. Spray a non-stick skillet with non-stick cooking spray. Crack eggs onto skillet and cook until whites are just set, about 2-3 minutes. Transfer to a plate and set aside. Flip crust over with tongs and spatula (or a pizza peel). Quickly brush the other side of the pizza with olive oil. Top with Parmesan, turkey ham, and eggs. Season with kosher salt and freshly cracked black pepper. Cook until underside is golden brown and cheese is beginning to melt, about 3 minutes on a gas grill or slightly longer on a charcoal grill. Remove from grill and let rest a few minutes before cutting and eating.